A few years ago I corresponded with some Mormons who complained that Catholic-style crucifixes are “gruesome” and “creepy.” (For those who don’t know, a crucifix is a depiction of Christ hanging on the cross.) I suspect that this complaint stems from a lack of understanding of what it means to be a Catholic. Catholics experience the crucifix as powerful and liberating, not gruesome and creepy. To appreciate the Catholic crucifix, one has to understand Catholic theology. Catholics believe that Christ’s death—the breaking of his body and the spilling of his blood—was the critical moment in our salvation. The Mass is their primary religious ritual, and in their view the bread and wine are literally changed into Christ’s actual, physical body and blood. Christ physically enters the believer in a moment of sublime mystical union. 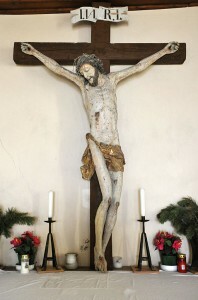 Thus although the crucifix is violent, it represents the central moment in salvation history, and the central moment in Catholic religious experience. It is not a moment we can afford to shrink away from. In addition to its salvific significance, Catholics also see the crucifixion as the supreme revelation of God’s gracious love for us. To quote the Apostle Paul, “God demonstrates his own love for us in this: While we were still sinners, Christ died for us.” Catholics view the crucifixion as the greatest sacrificial act in history: the moment that an omnipotent creator subjected himself to tremendous suffering and humiliation on behalf of creatures infinitely unworthy and inferior to himself. Visual depictions of the event help us to appreciate the great cost he willingly bore, and the great love it reveals. This is why many crucifixes show Christ’s wounds and emaciated figure in graphic detail: to underscore how much he was willing to suffer on our behalf. Mel Gibson’s Passion of the Christ, a grisly cinematic portrayal of the crucifixion, was a slightly more extreme version of the same thing. Gibson was trying to depict the ultimate sacrifice—ultimate pain, ultimate suffering, and ultimate cost, willingly borne for our sake because of God’s ultimate love. It is also important to recognize that Catholicism was founded long before the advent of mass literacy, and continues to flourish today among the poor and illiterate peoples of the world. Whereas Mormons and Protestants can read about the crucifixion in their Bibles, Catholics have typically had to communicate through visual media such as paintings and statues. Furthermore, images in the Catholic Church are much more than just teaching tools. Catholic theology teaches that Christ is graciously and miraculously present in such images. To look upon a statue of Christ is to look upon Christ himself. The crucifix thus makes Christ’s sacrifice literally present for every believer, so that we may all stand with his mother at the foot of the cross and grieve. This entry was posted in Art, Interfaith and tagged Catholicism, cross, crucifix, interfaith dialogue, symbols by Christopher Smith. Bookmark the permalink. One thing that’s good to remember is that the Eucharist/Communion only in later history — more a product of the proto-Enlightenment worldview influence — was contemplated more as far as “turning into” Christ, which tends to be aversive to many Protestant-era Christians. Early historical perspective, which continues to be affirmed in the Eastern Orthodox tradition, was to focus more primarily on the mystical union or Presence of Christ in the bread – a means (of several kinds of means) by which God bestows Grace on the believer. Therefore it is both symbolic, and it is also mystically infused with God’s presence “in” the Eucharist, but it is not necessary to view it primarily in terms of a physical change of ontology. This more Roman view is seen to put the focus too much where it is not intended; The Eucharist is seen not as a re-sacrificing of Christ, but a re-Presenting of a sacrifice made once and for all time. A very nicely and graciously written article, by the way. Thank you for this article. As a child, I was taught that the Crucifix was a Christological abhoration. I never really accepted this view even as a young child. One of my aunts is Catholic and I loved and respected her church and faith. I loved going to Christmas Mass or attending services throughout Holy Week with her. I decided for myself that the Crucifix was not ugly but sacredly beautiful. Although the Crucifix isn’t used in my church, the Episcopal Church, I still see it as important. I remember when you wrote about this on your personal blog a good while back. I agreed with it then and I agree with it now. Well done. Glad you guys enjoyed it! No, it stems from the fact that they are gruesome and creepy. A person can understand “what it means to be Catholic” and still walk away disagreeing with the aesthetics. For instance, many people (and some Mormons) consider Mormon Temples to be second rate cathedrals and the inside fancy hotel lobbies. They can understand what it means to be Mormon and still walk away with that impression; and I don’t begrudge them. They don’t have my faith in their significant. In some ways I agree with them, but the aesthetics is less important that the purpose. In other words, you might get my respect but you aren’t going to convince me to like them. You realize for a Protestant and even most Mormons those are fighting words? That doesn’t make the crucifixes less ominous, but even more so and blasphemous on top of that. Unlike all the other explanations this is one that destroys all that was built by the rest of the post. I and many other Christians read this and cry paganism and idol worship. Many who post here will attack my honesty, but I am only saying the truth. Interesting, Jettboy. I assume you feel the same about God’s miraculous and gracious presence in LDS temples as you do about Christ’s miraculous and gracious presence in Catholic icons? Aseertions that one is only saying the truth should not translate into a carte blache for nastiness. Nastiness, or how I really feel? Can you put what I wrote in more “friendly” terms or do you believe I just shouldn’t have written it because its just not what you say in polite company? Christopher Smith, no you would assume wrong. Sorry, crucifixes just don’t do anything spiritual for me. Sounds like both, but only you can answer that. Easily, but I’m not going to do your work for you. There are many ways to respectfully disagree with someone’s position. Okay, but as far as idolatry is concerned, isn’t the logic pretty much the same? “Catholic theology teaches that Christ is graciously and miraculously present in such images.” This is really a thoughtprovoking post, that a symbol can be more than a mere translation to another equivalent language, like “casa” means “house”—-as if that were all there is to it. Then what is a symbol? A spritual catalyst? A wormhole in the spiritual universe? A knife to open my core? Restoration of the Lost? If such magic is possible, and I belive that it is, maybe I can pull myself out of some spiritual hat. Christopher, the logic is not the same. Is God *in* the Temple? Considering what Mormons teach about God, neither He nor His Son are literally in the Temple experience. Their Spirit, like sunshine through an open window, is most certainly there. The very idea that an object can *become* God, rather than simply blessed *by* the Spirit of God, is often considered blasphemy or idolatry by Protestants and Mormons alike. They would say something was touched by the Hand of God if tactility must be introduced, but *never* literally become the Hand of God and therefore an object of worship. They would go farther and say the only physical object that ever *literally became God* would be His Son Jesus Christ born to Flesh. Its a distance and transformation issue if you must. The object doesn’t become God in the sense that it replaces God, the object is temporarily infused by God’s spirit, so to speak. Allen, that is a more comfortable way to put it, but I don’t think that is what Christopher Smith said in the last paragraph. I guess it depends how he would answer the question when you are looking at the crucifix are you looking at God? That isn’t what Catholics teach. The object doesn’t become God. It remains just an object. And as an object, Catholic theology is very clear that it must never be worshiped. It can be given “veneration of honor,” but never veneration of worship. I think you’re right, though, that the traditional Catholic concept of the way in which Christ is present in icons goes somewhat beyond the LDS concept of God’s presence in the Temple. You mentioned that because LDS think God has a body, they believe only his Spirit is present in the Temple. Catholics do sometimes use similar language. For instance, St. John of Damascus says icons are instruments of salvation which are “filled with divine energy and grace.” When pressed, however, I think they would say Christ makes himself bodily present in the image as well as spiritually present. That’s what they say about the Eucharist, anyway. How can Christ be bodily present in a physical object? Because Catholic theology is based on an Aristotelian theory of universals, in which a “type” (in this case, an icon) is both an individual in its own right and a true representative of its “archetype” (in this case, Christ). The archetype inheres in the type and can be accessed through it. This Aristotelian theory is pretty outmoded, and I suspect very few Catholics would be able to articulate it anymore. But this is how St. John of Damascus explained it, and I suspect an expert in Catholic dogma would tell you that it’s still the official understanding of Christ’s presence in images of him. I guess it depends how he would answer the question when you are looking at the crucifix are you looking at God? You’re looking at God in the sense that when you look at a window, you’re looking at what’s beyond the window. ETA: I also am liking Mark’s spiritual wormhole analogy more the more I think about it. It’s as if you folded time and space, so that two objects—Christ and the icon—inhabited the same physical space without losing their separate identities. Thank you Christopher. Your explanations make it sound less like an Idol than the last paragraph of the post, especially your window analogy. However, the belief that “a symbol or “type” (in this case, an icon) is both an individual in its own right and a true representative of its “archetype” (in this case, Christ),” is still a very uncomfortable belief for both Protestants and Mormons alike. Hey, I can explain how Baptism for the Dead is not really binding all day long and its not going to alleviate the uncomfortableness many feel. And that gets back to “gruesome” and “creepy” are about religious aesthetics and sensibilities and not just understanding the theology. Jettboy: the idea of the tension of the ikon, a physical-creation “wormhole” into the spiritual world, seen ultimately in Jesus, the eikon of God in the created world (Heb. 1), and sacramentalised in the experience of the Eucharist celebration, is not limited to the Roman Catholic and Eastern Orthodox experience and nor is it uncomfortable, blasphemous or idolatrous for “Protestants”. There are a number of liturgical Protestant traditions where this is a central and compatible world-view even if the aesthetics of it can play out a little differently from communion to communion. Your view of Protestantism as allied with Mormon world-view is best formed of those late-Reformation-tradition evangelical Protestant traditions born mostly from Dutch-German American Anabaptism. (In contrast, for example, read up on sacramental Baptist tradition in a place like Balkan Georgia– it’s very differently sacramentalised compared to its general American expression.) Also check out that Margaret Barker lecture I linked to in the first response. It will broaden your understanding of the First Temple symbolism in the sacramental rites of historical Christianity. The “Mormon-Anabaptist-Evangelical” view is a late and minority perspective compared to history and current worldwide Christian practice and needn’t be so combative as it is often expressed. My (Protestant) church holds services in a defunct cloister and has a cross at the front of the room. It used to be a crucifix but they lifted Jesus off it (and I assume are reverently storing him somewhere) because (as they say) they focus on Christ’s resurrection while Catholics focus on the death and the suffering (and you are meant to then understand that resurrection is clearly the superior choice). I never really understood that. Yes, crucifixes can be disturbing. But why shy away from what is in essence a violent act if that act is at the middle of your theology? Also, as a victim of violence myself, seeing the crucified Christ serves another role: it demonstrates to me quite concretely how God himself chose to align himself with the likes of me, with my story and the story of so many others. Gruesome and creepy? Perhaps, if you’re shortsighted enough that you can’t see the story behind it. Jettboy, it sounds to me like you don’t have a very clear understanding about the diverse viewpoints within Protestantism about incarnational theology. I apologize for the late comment, but I have to say that beauty and meaningfulness are and must be in the eye of the beholder. I personally find the cross to be a meaningful (though incomplete) representation of Christ’s sacrifice and love, but I do not find it beautiful.